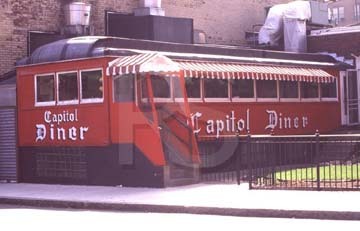 The Capitol Diner is a "Brill" built in 1928 and is listed on the National Register of Historic Places. It was originally named the "Miss Lynn Diner" and then renamed in 1938 after the Capitol Theatre which was located across the street. Always a great spot for breakfast and lunch. Friendly staff. Very generous portions! Located right under the railroad bridge in Central Square Lynn. If you are fascinated by diners you'll love Diners of the North Shore and Diners of New England, available below from Amazon.